“The day was gray and wet in the city that seldom buys.” Not what I expected as the opening sentence in a book on Forecast Fatale. 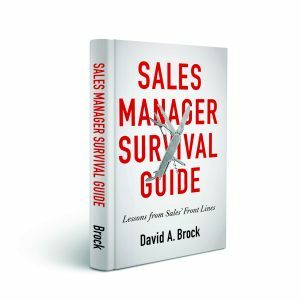 Techniques For Sales Professionals. Hmmm, what’s this about? 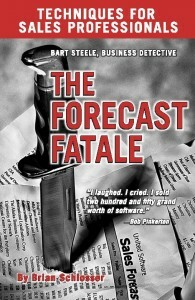 I decided to read on, Brian Schlosser’s book Forecast Fatale captivated me. 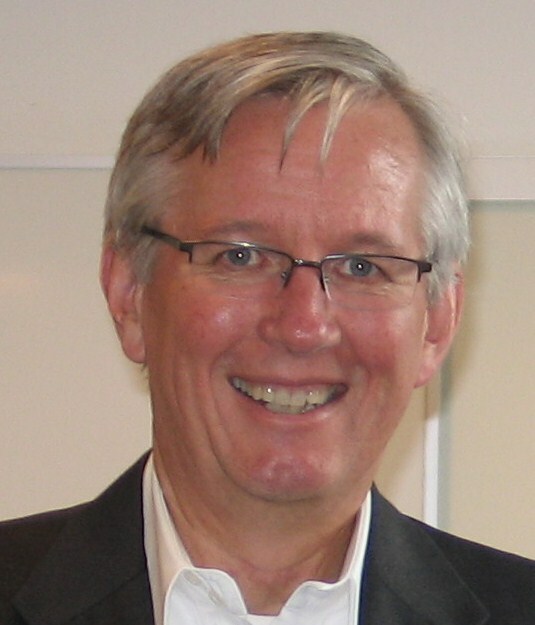 Brian’s lead character in guiding us through the trials and tribulations of a sales organization, needing to improve performance, is none other than business detective, Bart Steele. Written as a noir detective novel, with Bart Steele helping the CEO understand the challenges of a sales organization, as I read, I found myself reliving much of my past experience. I roared with laughter with each step of Bart Steele’s detective work throughout the book. The story was compelling and fun, it crystallized so much of what I’ve experienced as a sales professional, executive, and consultant. I was intrigued and set out on a bit of detective work myself. My goal was to find and interview business detective, Bart Steele. I wanted to find out what made him tick and learn from him. Bart proved to be very elusive, preferring to hide behind a cadres of gatekeepers. Despite all my techniques for engaging and getting around gatekeepers, I just couldn’t penetrate the shroud. Not one to be easily deterred, I decided to pursue Bart’s creator, Brian Schlosser. In my normal, best rapport building manner, I approached Brian, “I loved your book! Everyone should buy it! How the hell do I write a review for it? I just can’t do it!” Who could fail to respond to such a great opener? Dave: You’re a practicing sales executive, what made you want to dive in and write a book on selling, particularly in such an innovative manner? Brian: I think an informative story about sales needed to be written. I’ve read dozens of books on sales and taken a number of courses. I could never understand why a career that is so worthwhile and fun has taught as though is boring. I love my profession and want to teach people about it in a way they can relate to. In my experience, people relate to stories. I wrote the book as a noir business detective because I thought a pirate might be weird. The sales part; I live every day and believe in. The noir detective part is a style in writing that I love. The strange humor is what goes on in my head most of the time. I have a bit of an attitude and I thought it might be fun to let it show a little more than I usually do. Kinda like your blog – yes, I have read it and I noticed that you let your attitude issues show a little too. 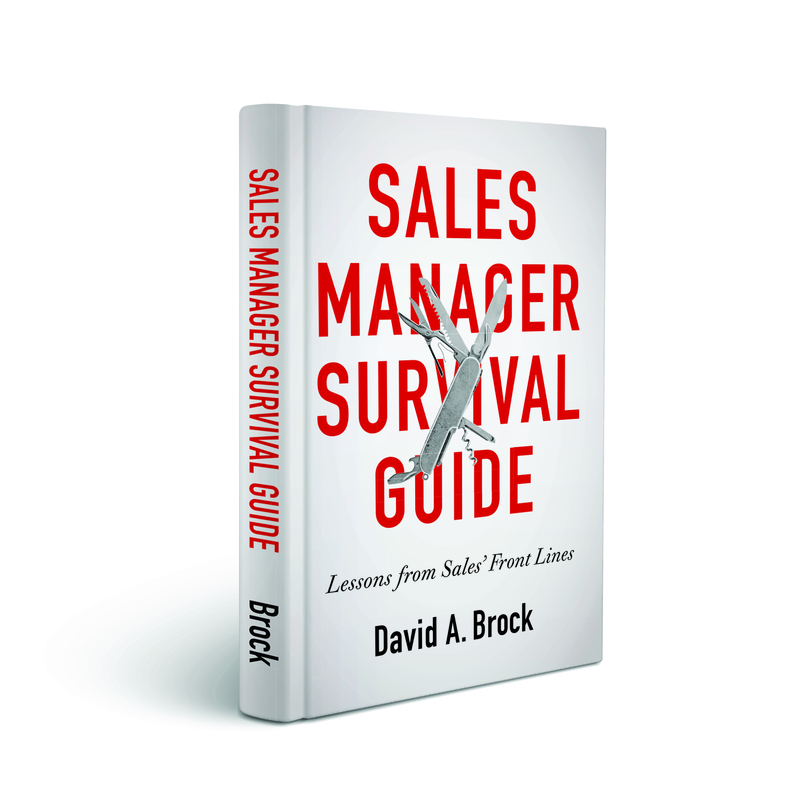 Dave: A couple of the core problems Bart identified in the book was weak sales management at all levels. If you could provide 3 insights and pieces of guidance to top sales executives on providing meaningful leadership for their teams, what would they be, and why would you choose those? Likewise for first line sales managers that want to maximize performance of their teams? 1. Stop flying a desk. Your job is in front of customers and prospects. I know you have to report to your management but find a way to do both. Sales professionals will never respect a sales exec that doesn’t sell – and they shouldn’t! 2. Develop relationships with your team at all levels. You can’t make good the decisions if you don’t know the truth. Truth does not fit on a form and get passed up the chain of command. Go get the truth. 3. Be a fanatic about making life good for your team. If you want the most out of them, you have to give them the very best your company can offer. A lot of people want to change things and make more work for the field. Ask them what they are doing to make it EASIER to sell? Some want to limit compensation to ensure the team doesn’t make too much. Ask them to share that compensation plan with your competition – when they join them! Some want to send “good enough” product programs out to the field. Defenestrate them! 1. Be truthful. Tell your people how they are doing. Tell them what they need to do. Tell them what they need to know about their forecast. Tell yourself the truth about your people and your prospects. 2. Be brave. Sometimes the truth is tough. You are paid to be brave enough to face it, tell it, and act on it. Be brave enough to like your people and work with them even though you sometimes have to make decisions that neither of you like. 3. Be joyful. You have a chance to make people’s lives better and achieve personal success. Let your joy show! Brian: I think that is a preposterous and scurrilous accusation! I would be far angrier if it wasn’t, also, true. I intentionally took the easy way out by telling sales professionals not to take the easy way out. In my experience, one of the worst things a sales person can do to their own success is to start to externalize the reasons for their performance. The product is weak, marketing didn’t give me good leads, the competitive intelligence is crappy…the list goes on. We all wish that those things were better in any company but, I don’t want to use that as an excuse for my performance and I don’t think any sales professional should. When I read the book now, I wish I had clarified that point a little more. Thanks for giving me the chance. As for better alignment: agree on measurement and measure. Then measure a little more. Cost per lead, revenue per lead, close time by lead source – all of it. Execs, marketing, and sales should agree on a set of measures and pursue them aggressively. Avoid getting esoteric – show me the ROI! Dave: The CEO in the story, Kristen, really was not knowledgeable of what high performing sales organizations look like and, other than meeting their numbers, what they should expect. I find this to be a common phenomenon for CEO’s who have had no sales experience. They are almost afraid to challenge the sales exec. Without jumping in and micromanaging the sales organization, what should CEO’s be looking at to make sure their sales executives are providing the right leadership and maximizing the performance of their teams? Brian: I portrayed Kristen as a very competent marketing person and good manager and then I took away her reasonable knowledge of sales at her company. That probably wasn’t fair but it made the plot work and, as you point out, it happens. I’d encourage CEO’s without a sales background to find out what methodology the sales force is using and learn about it. Then start asking questions based on it. It will be clear very quickly whether there is any organization in your organization. If people start resisting and telling you that sales is an art and not a science and they can’t use a method, beat them with a stick. Have I mentioned that HR loves me? CEO’s should not fly a desk either! Dave: One of the core problems in the story was the absence of a sales process. Unfortunately, it’s all too common a problem. Sales execs and managers know they have to have strong sales processes and they must execute them with precision. Why is it so difficult? Why do people seem to resist it so much? How do we get sales leaders, managers, and sales professionals to embrace and execute the sales process? Brian: I think the fault belongs with the industry. Sales processes over promised and under delivered for years. Complex processes promoted by weasels (my apologies to mammals of the genus Mustela) with spray-on tans have been the norm. People get confused and stop buying. Legitimate processes tend to have complexity layered on them by well-meaning managers over time and very few companies teach basic sales techniques to junior people. Since I’m being cranky, let’s not forget Universities. The CEO of a modest sized company will spend at least 30% of her time on sales related issues according to statistics that I just made up. I challenge you to find a University that devotes 30% of their curriculum to sales. In fact, most Universities don’t have one course on pure sales. Do they think people will lean this stuff from silly little detective books? I’m sorry, I’ve forgotten the question and it is nap time. In a beer haze, the interview was over. We fell quiet. I slowly sipped my beer, munched on some pretzels. Silently annoyed with Brian’s snoring, it was interupting my hazy thought process. This is a guy we need to listen to. He he’s right on target, been there, lived to tell about it, came out the other side and is making sales organizations better. Do yourself a favor, order the book, Forecasting Fatale or here. You’ll recognize many situations you’ve been in before–Brian will engage you in thinking about them in a different and refreshing manner. The book sounds very interesting and the interview was great – lots of good ideas and insight – going to send along to my colleagues.